A wreath is a well-known object of decor during the Christmas season. It is a symbol that represents eternity. As it encloses and unifies, its simple shape it represents desired peace, hopes, and dreams of all who celebrate Jesus and His purpose gift to humanity. Wreaths are traditionally used on doors to welcome family and friends to a home, but are also used indoors as wall decor, as part of a tablesetting, or as something to hang from a ceiling. They can be made from just about any substance, thereby creating natural Christmas decorations appropriate for every locale. 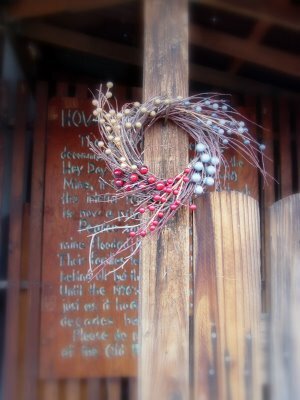 When searching the yard or nature trails outside, useful elements can be found for wreath making. Twigs, natural greenery, stems, leaf fronds, berries, seedheads, herb bundles, and pine cones all in combination or alone are interesting materials to make wreaths from. Even tumbleweed can be fashioned into a pretty wreath if that's all you can find to work with. The addition of a flocked red bow or one made from burlap or calico adds a final touch and a cheerful and welcoming wreath is the result. When traveling during the holiday season, I always enjoy seeing how those who decorate for Christmas create unique and interesting wreaths. The wreath pictured on this post was photographed in a tiny, non-commercial ghost town in Arizona. It created a charming reminder that although it may appear that a place is forgotten, the holiday spirit still lives. Here are a few other natural items that can be used to make a homemade Christmas wreath: bay leaves, baby's breath, dried berries, dried fruits like whole apples or oranges, fir cones, dried artichoke heads, ivy, hydrangea heads, thistle heads, fresh or dried moss, eucalyptus leaves, nuts in their shells, cinnamon sticks, dried lavender or rosemary bundles, dried mistletoe, boxwood, and variegated holly. What a sweet wreath! Have a merry Christmas, my friend - and here's to many more blog visits to come in the new year. I always love visiting your blog - it is such an inspiration! Merry Christmas! Lovely wreath. The story describing the wreath was fascinating too. Thanks, I learned something new.